Black and white photograph of the Magi family on New Year's, 1950. Massimo Iacopo Magi and his wife stand in the centre of the photograph. Massimo's brother stands off to the right and his son Philip stands off to the left. 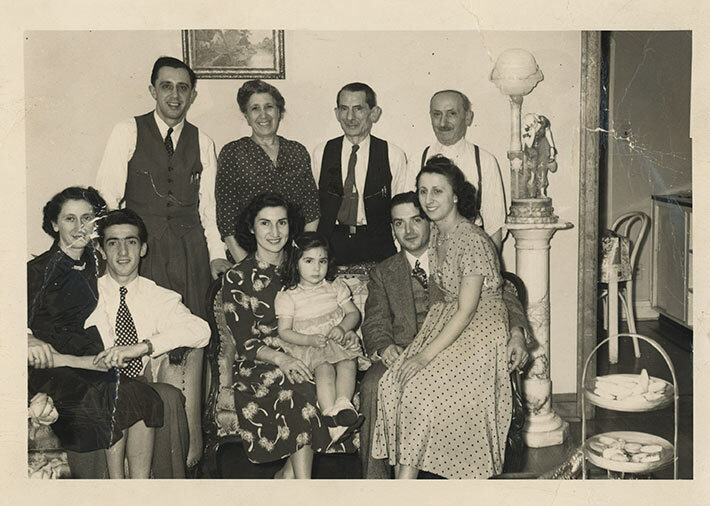 Massimo's daughters, Rina and Iole are both seated on the laps of their husbands in the foreground. Philip's wife and daughter are seated in the centre of the photograph. An elaborate lamp fabricated at the Florentine Lighting Company can be seen at the right next to Massimo's brother. Massimo Iacopo Magi was born in 1884 in Limano, Bagni di Lucca, Italy. He immigrated to Canada and settled in Toronto where he was the co-owner of the Florentine Lighting Company. On June 10, 1940, Magi was arrested while at work. According to the RCMP, his arrest was due to his affiliation with the Fascio Principe Umberto, where he was the Secretary, and for overseeing the Toronto dopolavoro (after work) group. A number of his employees, including Ruggero Bacci were arrested along with him. At the time of his arrest Massimo and his wife had three adult children, Rina, Iole and Philip, who were living at home. Magi was released from Camp Petawawa on June 5, 1941. Upon his return home he started another business, Tuscan Manufacturing Company, which imported artifacts from Italy.